Oil prices have risen dramatically over the past year. When they passed $100 a barrel, they hit new heights, expressed in dollars adjusted for inflation. As they passed $120 a barrel, they clearly began to have global impact. Recently, we have seen startling rises in the price of food, particularly grains. Apart from higher prices, there have been disruptions in the availability of food as governments limit food exports and as hoarding increases in anticipation of even higher prices. Oil and food differ from other commodities in that they are indispensable for the functioning of society. Food obviously is the more immediately essential. Food shortages can trigger social and political instability with startling swiftness. It does not take long to starve to death. Oil has a less-immediate — but perhaps broader — impact. Everything, including growing and marketing food, depends on energy; and oil is the world’s primary source of energy, particularly in transportation. Oil and grains — where the shortages hit hardest — are not merely strategic commodities. They are geopolitical commodities. All nations require them, and a shift in the price or availability of either triggers shifts in relationships within and among nations. It is not altogether clear to us why oil and grains have behaved as they have. The question for us is what impact this generalized rise in commodity prices — particularly energy and food — will have on the international system. We understand that it is possible that the price of both will plunge. There is certainly a speculative element in both. Nevertheless, based on the realities of supply conditions, we do not expect the price of either to fall to levels that existed in 2003. We will proceed in this analysis on the assumption that these prices will fluctuate, but that they will remain dramatically higher than prices were from the 1980s to the mid-2000s. The Cold War between the United States and the Soviet Union, in which the focus was on the military balance between those two countries, particularly on the nuclear balance. During this period, all countries, in some way or another, defined their behavior in terms of the U.S.-Soviet competition. The period from the fall of the Berlin Wall until 9/11, when the primary focus of the world was on economic development. This was the period in which former communist countries redefined themselves, East and Southeast Asian economies surged and collapsed, and China grew dramatically. It was a period in which politico-military power was secondary and economic power primary. The period from 9/11 until today that has been defined in terms of the increasing complexity of the U.S.-jihadist war — a reality that supplanted the second phase and redefined the international system dramatically. With the U.S.-jihadist war in either a stalemate or a long-term evolution, its impact on the international system is diminishing. First, it has lost its dynamism. The conflict is no longer drawing other countries into it. Second, it is becoming an endemic reality rather than an urgent crisis. The international system has accommodated itself to the conflict, and its claims on that system are lessening. The surge in commodity prices — particularly oil — has superseded the U.S.-jihadist war, much as the war superseded the period in which economic issues dominated the global system. This does not mean that the U.S.-jihadist war will not continue to rage, any more than 9/11 abolished economic issues. Rather, it means that a new dynamic has inserted itself into the international system and is in the process of transforming it. It is a cliche that money and power are linked. It is nevertheless true. Economic power creates political and military power, just as political and military power can create economic power. The rise in the price of oil is triggering shifts in economic power that are in turn creating changes in the international order. This was not apparent until now because of three reasons. First, oil prices had not risen to the level where they had geopolitical impact. The system was ignoring higher prices. Second, they had not been joined in crisis condition by grain prices. Third, the permanence of higher prices had not been clear. When $70-a-barrel oil seemed impermanent, and likely to fall below $50, oil was viewed very differently than it was at $130, where a decline to $100 would be dramatic and a fall to $70 beyond the calculation of most. As oil passed $120 a barrel, the international system, in our view, started to reshape itself in what will be a long-term process. Obviously, the winners in this game are those who export oil, and the losers are those who import it. The victory is not only economic but political as well. The ability to control where exports go and where they don’t go transforms into political power. The ability to export in a seller’s market not only increases wealth but also increases the ability to coerce, if that is desired. The game is somewhat more complex than this. The real winners are countries that can export and generate cash in excess of what they need domestically. So countries such as Venezuela, Indonesia and Nigeria might benefit from higher prices, but they absorb all the wealth that is transferred to them. Countries such as Saudi Arabia do not need to use so much of their wealth for domestic needs. They control huge and increasing pools of cash that they can use for everything from achieving domestic political stability to influencing regional governments and the global economic system. Indeed, the entire Arabian Peninsula is in this position. The big losers are countries that not only have to import oil but also are heavily industrialized relative to their economy. Countries in which service makes up a larger sector than manufacturing obviously use less oil for critical economic functions than do countries that are heavily manufacturing-oriented. Certainly, consumers in countries such as the United States are hurt by rising prices. And these countries’ economies might slow. But higher oil prices simply do not have the same impact that they do on countries that both are primarily manufacturing-oriented and have a consumer base driving cars. East Asia has been most affected by the combination of sustained high oil prices and disruptions in the food supply. Japan, which imports all of its oil and remains heavily industrialized (along with South Korea), is obviously affected. But the most immediately affected is China, where shortages of diesel fuel have been reported. China’s miracle — rapid industrialization — has now met its Achilles’ heel: high energy prices. China is facing higher energy prices at a time when the U.S. economy is weak and the ability to raise prices is limited. As oil prices increase costs, the Chinese continue to export and, with some exceptions, are holding prices. The reason is simple. The Chinese are aware that slowing exports could cause some businesses to fail. That would lead to unemployment, which in turn will lead to instability. The Chinese have their hands full between natural disasters, Tibet, terrorism and the Olympics. They do not need a wave of business failures. Therefore, they are continuing to cap the domestic price of gasoline. This has caused tension between the government and Chinese oil companies, which have refused to distribute at capped prices. Behind this power struggle is this reality: The Chinese government can afford to subsidize oil prices to maintain social stability, but given the need to export, they are effectively squeezing profits out of exports. Between subsidies and no-profit exports, China’s reserves could shrink with remarkable speed, leaving their financial system — already overloaded with nonperforming loans — vulnerable. If they take the cap off, they face potential domestic unrest. The Chinese dilemma is present throughout Asia. But just as Asia is the big loser because of long-term high oil prices coupled with food disruptions, Russia is the big winner. Russia is an exporter of natural gas and oil. It also could be a massive exporter of grains if prices were attractive enough and if it had the infrastructure (crop failures in Russia are a thing of the past). Russia has been very careful, under Vladimir Putin, not to assume that energy prices will remain high and has taken advantage of high prices to accumulate substantial foreign currency reserves. That puts them in a doubly-strong position. Economically, they are becoming major players in global acquisitions. Politically, countries that have become dependent on Russian energy exports — and this includes a good part of Europe — are vulnerable, precisely because the Russians are in a surplus-cash position. They could tweak energy availability, hurting the Europeans badly, if they chose. T hey will not need to. The Europeans, aware of what could happen, will tread lightly in order to ensure that it doesn’t happen. As we have already said, the biggest winners are the countries of the Arabian Peninsula. Although somewhat strained, these countries never really suffered during the period of low oil prices. They have now more than rebalanced their financial system and are making the most of it. This is a time when they absolutely do not want anything disrupting the flow of oil from their region. Closing the Strait of Hormuz, for example, would be disastrous to them. We therefore see the Saudis, in particular, taking steps to stabilize the region. This includes supporting Israeli-Syrian peace talks, using influence with Sunnis in Iraq to confront al Qaeda, making certain that Shiites in Saudi Arabia profit from the boom. (Other Gulf countries are doing the same with their Shiites. This is designed to remove one of Iran’s levers in the region: a rising of Shiites in the Arabian Peninsula.) In addition, the Saudis are using their economic power to re-establish the relationship they ha d with the United States before 9/11. With the financial institutions in the United States in disarray, the Arabian Peninsula can be very helpful. China is in an increasingly insular and defensive position. The tension is palpable, particularly in Central Asia, which Russia has traditionally dominated and where China is becoming increasingly active in making energy investments. The Russians are becoming more assertive, using their economic position to improve their geopolitical position in the region. The Saudis are using their money to try to stabilize the region. With oil above $120 a barrel, the last thing they need is a war disrupting their ability to sell. They do not want to see the Iranians mining the Strait of Hormuz or the Americans trying to blockade Iran. For the United States, the situation is largely a push. The United States is an oil importer, but its relative vulnerability to high energy prices is nothing like it was in 1973, during the Arab oil embargo. De-industrialization has clearly had its upside. At the same time, the United States is a food exporter, along with Canada, Australia, Argentina and others. Higher grain prices help the United States. The shifts will not change the status of the United States, but they might create a new dynamic in the Gulf region that could change the framework of the Iraqi war. This is far from an exhaustive examination of the global shifts caused by rising oil and grain prices. Our point is this: High oil prices can increase as well as decrease stability. In Iraq — but not in Afghanistan — the war has already been regionally overshadowed by high oil prices. Oil-exporting countries are in a moneymaking mode, and even the Iranians are trying to figure out how to get into the action; it’s hard to see how they can without the participation of the Western oil majors — and this requires burying the hatchet with the United States. Groups such as al Qaeda and Hezbollah are decidedly secondary to these considerations. We are very early in this process, and these are just our opening thoughts. But in our view, a wire has been tripped, and the world is refocusing on high commodity prices. As always in geopolitics, issues from the last generation linger, but they are no longer the focus. Last week there was talk of Strategic Arms Reduction Treaty (START) talks between the United States and Russia — a fossil from the Cold War. These things never go away. But history moves on. It seems to us that history is moving. 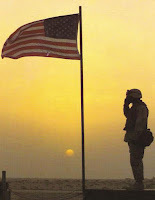 To those who made the greatest sacrifice for our nation and our way of life ... we are in debt, may we never forget. 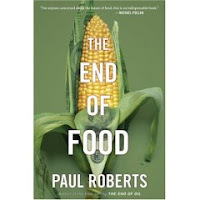 Paul Roberts, the author of the new book, "The End of Food," offers a timely eye-opening editorial below that must be digested if you are of the opinion that the food situation is going to be resolved anytime soon. For anyone wondering where food prices are really headed, the news that Beijing has begun buying up farmland in Africa and South America offers a troubling hint. When China began acquiring oil fields in the 1990s, it signaled both the end of China's self-sufficiency in oil and the start of a competition between China and other big oil importers that helped push crude prices to their current record levels. That the world's most populous nation now seeks to lock up pieces of foreign food production not only confirms that China has reached the end of food self-sufficiency as well, but suggests that Western hopes for a quick end to today's food-price crisis could be overly optimistic. According to conventional wisdom, our food crunch is a temporary glitch. Because grain shortages are being caused by many factors — new demand by biofuel refineries, drought in Australia, among others — the pain can't last. Eventually, drought will abate. Biofuels programs will be reined in. Most important, farmers will plant more acres and boost global supplies, just as they always have during shortages. Food may never again be dirt cheap, but by next year, prices for key crops will swing back to a more moderate line. Right? It's a comforting picture, to be sure. But as Beijing's real-estate spree suggests, food prices are being driven by deeper, more fundamental factors that won't be so easily resolved. Mountain House Canned Foods Now Unavailable! Mountain House (Oregon Freeze Dry, Inc.) notified dealers that demand has reached five times last year's levels and that they are forced to stop taking further orders for their canned varieties for several months, in order to catch up. Current back-orders are now out into July, so for those who submitted orders in the first half of May--please be patient--you are not forgotten, just way down the list at this point. Orders submitted earlier are due to ship soon. Be assured--there is no worry about submitted orders not being filled. If you have an order outstanding--it WILL be processed as soon as possible. Those of you still awaiting delivery of a Safecastle 3-case/18-variety kit, we are yet waiting for shipment of the last of the bulk order for the contents of those kits. We still expect that our kit buyers will take delivery by about the end of May. So ... we have removed from our buyers club store our Mountain House can-case listings until further notice (probably the Sept./Oct. timeframe). HOWEVER--WE DO HAVE ONE GOOD SIZED EXTRA ORDER OF MOUNTAIN HOUSE CANS in the queue that should arrive here in July. At that point, we will make a special offer to members for that food, so stay tuned, if that is of interest. In addition, we have been informed by other suppliers that they are on the verge of running out of a wide range of emergency foods. So we have made an additional bulk order of some basic foods such as canned butter, cheese, bread, rice, and more to serve the needs of our members for at the least the short term. All indications are, the food crisis will become much worse before it improves. Act accordingly please, and prepare your household. Mountain House foods packed in mylar, stand-up pouches (in single-, double-, and 4-serving sizes) remain available. We have done the math and compared the pouches to the cans and we have been surprised to realize that with the latest MH-can-price hikes, the pouches actually deliver about the same food value as the cans, dollar for dollar, calorie for calorie. Of course, on the plus side, you are able to stock up on a wider variety of foods for your money and have your meals prepackaged in meal-sized, warm-able containers! Purchase pouch cases totaling at least $1275 (after member discount), and we'll apply an EXTRA 10% discount off your order after you checkout and before we charge your card. That's a 30% discount for buyers club members! And of course, everything ships free, as always. Or, purchase at least $650 worth of pouch cases (after member discount), and we'll apply an EXTRA 5% discount on your order after you checkout and before we charge your card. That makes for a 25% discount for buyers club members! Sorry--this offer does not apply to the 7-Day Just in Case kit or the 72-Hour kit. Check out your MH pouch case options here. Shop for other available emergency foods while you still can here. Join the Safecastle Royal Buyers Club for a one-time $19 fee. Disasters are a Message from God? I have to say ... this series of online video clips by Dr. Chris Martenson is the most valuable and timely internet info resource I've ever come across! Spend a little over an hour watching the series, from beginning to end, and you'll likely feel a great deal more in tune with why things are happening the way they are and where we are headed. As the good doctor says, "The next 20 years are going to be very different from the last 20 years." Understand the risks and probabilities, and you can't help but be smarter about your efforts to prepare. Labels: Crystal ball, Cultural realities, How to be ready, Political realities, Why prepare? 1. FEMA and some relief agencies are scarfing up any available MREs, grains, rice, and beans in the USA to send to Myanmar recovery efforts. Supplies of most of that were already in very short supply, so this is a significant punctuation mark to the current situation! 2. Mountain House freeze-dried canned varieties are increasingly on backorder, even for dealer orders, just from the increased US demand of the last few months. Right now--almost 20% of their varieties are out of stock. These foods are also typically tapped for relief efforts, and may indeed be impacted as well, though I haven't yet gotten the word on whether that is the case this time. 3. Other brands--canned butter, cheese, freeze dried fruit, canned bread, eggs, and dried milk and milk substitutes are disappearing fast now again--much going to disaster relief. 4. For the last week, it has been an impossible challenge for me to find large quantities of foods of almost any kind from our big-time suppliers. I've got a couple of my biggest orders ever waiting to be placed if only I can find a wholesaler with the food available. We're being flexible and trying to be patient, but we're talking dozens of pallets of food here, and that kind of supply is not available in the near-term anymore (and going forward, no one is optimistic they can deliver till maybe fall at the earliest--and quite possibly not then). 5. Another development--one of our larger package customers (one pallet) had their order disappear from the delivery truck the night before it was to arrive to him this week. Of course, he's getting replacement food, but I just hope this is not a harbinger of things to come. Published on 4 May 2008 by Resource Insights. Almost two years ago I wrote a piece called "Is just-in-time nearly out of time?" laying out how completely the just-in-time inventory management idea had infected businesses, governments and even nonprofit organizations. I catalogued concerns that the practice of holding razor-thin inventories of many critical items such as food, fuel and medical supplies could potentially imperil our ability to provide them in circumstances where 1) supplies grow unexpectedly tight, 2) logistical lines are impaired or cut, or 3) a large humanitarian catastrophe requires surge capacity for food aid and medical treatment. Fast forward to 2008. Food riots are spreading across the world as soybean prices have more than doubled, corn and wheat prices have tripled, and rice prices have risen to more than five times their low of $4 in 2003. As a result of two decades of low agricultural prices, many governments became complacent and paid scant attention to food issues. They drew down grain stockpiles, neglected agricultural research and rural assistance, and generally took the attitude that market forces should increasingly dictate food production and prices. Food was becoming just another input into the world industrial system. All that has changed as swiftly as grain prices have risen. India, which has always maintained a government stockpile of wheat, purchased several million tons in the international markets last year after six years with no imports. Malaysia announced a plan to "develop stockpiles of essential foodstuffs like rice and cooking oil." Guatemala announced plans to address food prices that include increasing food stockpiles within the country. Several countries announced bans or restrictions on rice and wheat exports. This is an important read if your crystal ball is at all foggy and you need to discern the future of the economy and your personal well-being. Be sure to also view the MSN video on the column pages: "What Farmers are Saying." Forget supply and demand. We're now seeing scarcity economics at work -- what happens when buyers fear they won't get what they need at any price. If you think prices have become insane, you're right. But insanity rules markets for everything from oil to rice right now. In fact, insanity is the new "normal." For example, why should oil sell for $119 a barrel, a whopping $55 a barrel, or 86%, higher than it did last April? [snip] Read the entire column. This video is by the famed columnist James Lileks.